One in six children experiences sensory difficulties that affect everyday life. 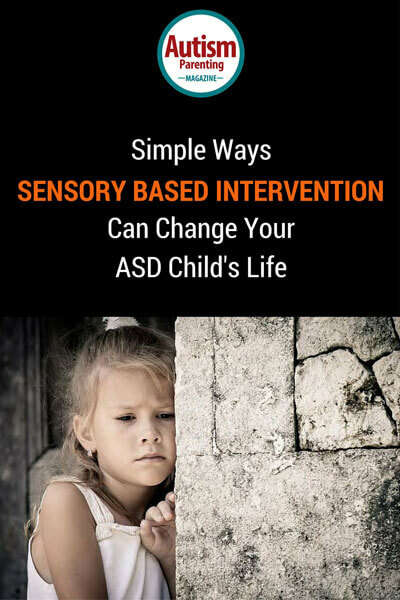 Sensory based intervention has been shown effective. A family-centered approach emphasizes parental coaching in natural environments of the family. Despite the importance of intervention carryover, adherence is believed to be low. This is due to the overwhelming nature, required commitment and lifestyle changes asked of children and their parents. Embedding sensory activities into everyday routines can be made easy by using habits. Habits are triggered by one of five cues: time, place, other people, personal state and preceding action. Each sensory activity made into a sensory habit is one less burden to think about. Technology can help acquire and maintain habits. It cannot perform sensory activities for the parents, however, it can remind families what to do and when, it can offer ideas for activities that parents have with them at all times and places, it can alleviate the real time monitoring pressure and facilitate reporting and communication with therapists. But most importantly, if used correctly, it can help families acquire sensory habits. Sensory carryover into everyday life is probably the most critical component of any sensory therapy, yet the hardest to implement. While there is no official research on adherence levels, most practicing Occupational Therapists (OT) say, adherence is low. In birth to three for example, the potential to make a lasting impact is huge, but the challenge falls on the shoulders of parents. If we could better understand what makes this such an insurmountable task, perhaps we can figure out some ways to help. The initial feeling a family has when first learning about a sensory home program is overwhelming: What activities to do? When to do them? How exactly to do each one? How to get the child to cooperate? What happens during day care? Sitters? How can I remember all of this? How can I keep track of all this? How can I find time and energy for all this? How can I accurately report back to the therapists? If the initial overwhelming shock didn’t scare them away, we usually see families trying to get a handle on the commitment required. Realizing sensory home programs are not a ‘let’s take a pill and we are done’ sort of treatment, the level of commitment required starts to sink in. They realize they need to add to their already busy lives, sensory activities several times per day, regardless of where they are, what equipment they have with them, their child’s moods, the caregiver’s energy level, and they need to maintain consistency over time! And when they do have their next OT session, many find it difficult to accurately describe their experiences since the last session. The natural human tendency to focus on extreme and recent events makes the measurement and reporting back to OT biased and inaccurate, leading to poor or inadequate adaptations of the home programs, through no fault of the therapists. But even those families that overcome this measurement challenge by filling in semi-structured forms, get bogged down with the need to log and communicate this across caregivers. Questions are asked, instructions and guidance are passed, ideas and concerns are shared. Weekly sessions are rarely enough. So our poor parents that started with being overwhelmed, got their commitment in place, had plenty of accessible diversification ideas, were able to measure performance in real time and communicate frequently with their therapist, now need to maintain this level of engagement for a long time because sensory home programs are not a sprint, they are a lifestyle! Perhaps some help can come from an unexpected source. The study of habits evolved from helping people get rid of bad habits. In his book The Power of Habit, Charles Duhigg[i] talks about the habit loop, “neurological loop at the core of every habit, a loop that consists of three parts: a cue, a routine and a reward.” The process of changing habits starts by identifying the ‘bad’ routine you want to change, you then want to experiment with different rewards in order to figure out the craving that drives the routine, and finally you want to identify the cue that triggers your habit loop. Such cues usually fit into one of five categories: time, place, other people, personal/emotional state and preceding action. But habits are not all bad. Habits play an important role in making our lives easier. Habits take away the mental burden of thinking…we save on energy of remembering, decisions, and consciousness. What if we could harness this power of habits to make lives of our parents a little easier? What if these overwhelmed, over committed bogged down parents won’t have to spend so much mental energy on adhering to sensory home programs? If we could ‘plant’ new habits into families’ everyday routines and if those new habits could be just what the therapist ordered, we can take away some of the burden and make sensory home program easy to implement. Even if we can replace only half of the planned sensory activities with sensory habits – we just made the parents’ lives half as easy! When sessions are completed at home, child care or in the community, the therapists can help adjust a routine that the family needs help with, in the personal context of the activity. If the child is struggling to let mom know what she wants for a snack after nap, the therapist will come to the home during snack time to help mom problem solve how best to have her child communicate which snack she wants. If the child has sensory needs that are interfering with getting dressed, the OT will assist the family during dressing at the beginning of the day. If the child does not want to nap at daycare, the OT can complete a visit there to coach the child care provider in what adaptations can be made to make nap time successful. Once you build the capabilities of the caregivers, they are able to problem solve and create new sensory habits on their own in other situations, making adherence to a functional activity possible. Morning routines can be a real nightmare. Luckily they all have an easy cue – they all start in the morning. What if instead of fighting our way to get the child out of bed, we make a jumping game, first on the bed and then as far as possible out of bed, and we repeat this every morning for a couple of days reinforcing the habit. This way we align the parents’ reward of getting to the next stage of the morning routine faster, with the child’s game. True that we can simply tell families to jump on the trampoline in the morning but that would only be adding another chore to an already tight morning schedule. Bedtime routines are similar in many ways. Most routines include a bedtime story. By asking the child to carry the book(s) into the room (it helps to place them in another room to begin with) we gain a heavy work activity without having parents remember to do it. Parents go through doors with kids several times per day (into and out of the house, Kindergarten, etc.). By introducing a habit of letting the child open the door for the parents against some resistance (“see if you can make it…”) we’ve seamlessly added another sensory habit. Yes we can guide them to play a push against a wall game, but wouldn’t it be much easier for the parents if every time they went through a door their child would ask to open it and get some heavy work fun that matches the parent’s functional reward. Grocery shopping with a child can be challenging at times. Why not make it a time that the child can be a “helper” for dad. The child can help push the shopping cart which will be a more difficult task once the cart is full. Counting red apples and putting them in the bag will provide some heavy work while working on counting and colors. Emotional state is another common trigger for habits (e.g. “we feel blue, we eat something sweet…”). Because of its nature, this cue leads us to teaching the child to self regulate. With smaller kiddos, parents need to identify the state their child is in but they can reflect it back to the child. The sensory habit can be any number of calming activities, such as wrapping under a heavy blanket. And like with all other cues, if repeated in the same personal context, it helps reinforce the habit leading to the child asking for the calming activity when feeling a certain way. Most of us have a habit of placing the keys on the table/counter after we walk into our home. The preceding action of walking in serves as a cue, rewarding us by knowing where to find our keys without burdening our mind with remembering where placed them (and we all know how we get lost when we divert from this habit…). In a similar way, we can take house chores and create sensory habits that can follow their cue. Doing the laundry can serve as a great cue for heavy work. Pulling the laundry out of the dryer and then pushing the basket, or carrying it if the child is old enough to carry the basket are great heavy work activities. Research (Quittner et al. 2008, Journal of Pediatric Psychology) in many pediatric chronic treatments shows adherence is low and measurement is biased. It also shows that real-time electronic measurements are the ‘gold standard’. While it’s very difficult to get kids to take a medicine or insulin shots, when dealing with sensory activities it can be easy. We have one thing going for us when dealing with sensory programs – they’re fun! And if we can create sensory habits they can be easy too. Technology can help make this fun and easy for therapists and parents alike. ‘Old habits die hard’, yet luckily when working with children birth to three (and even older kids) they aren’t old… and neither are their habits. In fact habit acquisition in children is much easier. Their parents’ is another story. That’s why alignment of rewards between parent and child is so important. The child will have adopted most fun habits within a couple of repetitions where the parent is still far from self habit changing. This way the child will act as the reminder and demand the newly acquired habit on cue. We just need help the family come up with good habit loops – real life triggers that lead to fun sensory activities that serves a parent’s functional goal – making sustainable sensory habits that make adherence to sensory home programs fun and easy. Technology can help. Time based cues can be acquired by using alarm reminders in smartphones (see The Psychology of Notifications: How to Send Triggers that Work by Nir Eyal, author of Hooked). The fact that most parents carry their mobile devices with them at all times and to all places can help when trying to embed a new location based habit. By giving multiple caregivers access to the same system we can help facilitate people based habits. A variety of activities illustrated in a way children can relate to, can help them acquire emotional-state based habits by letting them choose what feels right for them at any personal state they are in. Finally, preceding action based habits can be taught by showing ideas for sensory activities within every day chores and routines – the more the sensory activity is linked to an everyday task or object the more likely it is the family will have adopted it into a sensory habit. The technology does not solve the problem nor does it perform the sensory activities for the parents. However, it can help reduce the overwhelming fear by taking away the need to remember what to do and when. It can offer multiple options for activities that parents have with them at all times and places. It can alleviate the real time monitoring pressure, and facilitate reporting and communication with therapists. But most importantly, if used correctly, technology can help families acquire sensory habits. Amy Owens, OTR is the Executive Director of Infant Toddler Services of Johnson County. She has over 20 years of experience working with children, ages birth to three. Amy can be contacted at amy.owens@itsjc.org. ­­­­Oren Steinberg, is a parent of two children with SPD. He co-founded SensoryTreat with his wife, a neuropsychologist. SensoryTreat offers parents and therapists a technology platform and printed content that help adhere to sensory home programs. Oren can be contacted at: oren@sensorytreat.com Amy Owens, OTR is the Executive Director of Infant Toddler Services of Johnson County. She has over 20 years of experience working with children, ages birth to three. Amy can be contacted at amy.owens@itsjc.org.